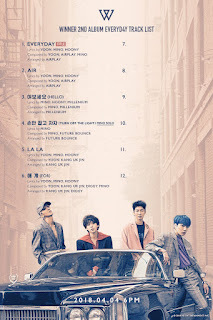 WINNER 2nd Album 'EVERYD4Y' Tracklist - D-8 WINNER of YG Entertainment will comeback. YG Entertainment today released tracklist of EVERYD4Y tracklist. One of the tittle of the trackslit is Everyday. Everyday composed by Kang Seung Yoon, Airplay and Mino. Millenium (Raesung), YG`s trainee, also participated on the WINNER album. He wrote a lyric also compossed one of WINNER album tittled `Hello`. Raesung is not debut yet but he actives to make a good music, he also participated on iKON`s 2nd comeback as a composer. There are 12 tracks on WINNER 2nd comeback album, but in D-8 they showed 6 tracks. The tittle of the tracks are Everyday, Air, Hello, Turn Off The Light, La La, and For. One of the track is Mino`s solo song. Let`s root WINNER comeback guys.